Medical Emergency - Closed angle glaucoma is an emergency, because they can lose their sight in hours if something isn't done! 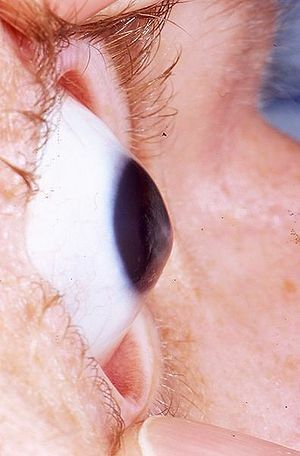 This is a picture of the back of the eye. 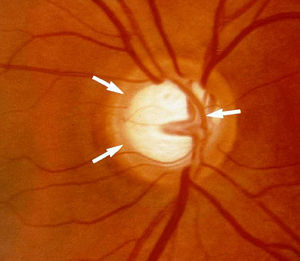 The optic disc is very cupped, which can be a sign of glaucoma. Glaucoma is a condition where the pressures in the eye increase, eventually causing damage to the optic nerve. Not actually that common, but very important, which is why opticians look for it. One case links treatment with latanaprost with keratoconus - cone shaped eye. One word - awesome! Open angle glaucoma - in this version, fluid can drain fairly well inside the eye, and the progress of the disease is very slow. Often people are only diagnosed after some sight loss has occurred. Closed angle glaucoma - in this version, the eye cannot drain properly, and this can come on over hours, being very dangerous as it can cause sight loss within the day. Therefore anyone with sudden onset eye pain needs seeing urgently. You can try a few drugs that reduce intraocular pressure such as latanoprost. Next step is surgery, generally laser treatment, or normal surgery. The aim of this is again to increase drainage and reduce pressure within the eye. This page was last modified on 7 June 2010, at 19:38.